Prior to the Cuba-Orioles game The Stars and Stripes and Cuban national flag flew side-by-side in Estadio Latinoamericano. It took Baltimore Orioles owner Peter Angelos and his staff about four years of persistent and hard work to pull off an historic two game exhibition series against a team from Cuba in the spring of 1999. But it was well worth the wait! A major league team had not set foot in Cuba since 1959 when the Los Angeles Dodgers played the Cincinnati Reds in an exhibition game. With top-level assistance from the administration of U.S. president Bill Clinton, Major League Baseball and the Major League Players Association, the Cuban Amateur Baseball Federation and the Cuban government, the two countries were able to pull it off. 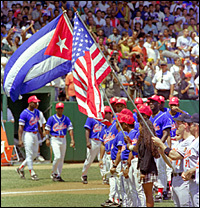 Following renovations to Latinoamericano Stadium in Havana, the first historic game took place on March 28, 1999. The Orioles, squeaked out a 3-2 win in eleven innings when Harold Baines singled off of Cuban pitcher Pedro Luis Lazo, driving in Will Clark for the victory. Baltimore had been leading 2-1 until the bottom of the eight inning when Cuba’s marquee player, Omar Linares, drove in Jose Antonio Estrada to tie the game. Cuban starter Jose Ibar was taken out of the game following a two-run shot by Charlie Johnson in the second inning. Then Jose Ariel Contreras shut down the Orioles for eight innings, striking out 10 and giving up just two hits. Just weeks earlier, Cuban players made the switch from aluminum to wooden bats. During batting practice the Orioles wowed Cuba fans as baseball after baseball was belted out of the park. But during the game, they used a Cuban Batos baseball, which didn’t carry like the major league baseball. During the second exhibition game, held in Camden Yards, Baltimore on May 3, the Cuban team put on a hitting exhibition against 5 Baltimore pitchers, using the major league baseball. Cuba took the game 12-6 as shortstop Danel Castro went 4-4 with two triples. Omar Linares, reached base six times and was 4-4, while designated hitter Andy Morales hit a three run home in the ninth inning. Pitcher Norge Luis Vera pitched brilliantly, shutting down the Orioles for nearly seven innings. Nearly 48,000 packed the Baltimore park and 500 credentials were issued to media from around the world. It was the first time ever that a major league team had faced a Cuban national squad on U.S. soil. Check out our photo gallery for pre-game and action photos from Games 1 and 2 of the Cuba-Orioles series.